Today’s guest blogger is Martin Howard, whose amazing collection of late-19th-century typewriters can be seen at antiquetypewriters.com. Lucien S. Crandall, the man behind the Crandall – New Model, was born in Broome County, New York, in 1844. He would become one of the great early typewriter pioneers of the 1860s and 1870s. Crandall patented perhaps 10 typewriters, about six of which were manufactured. All of his designs were very intriguing and brilliantly imagined. 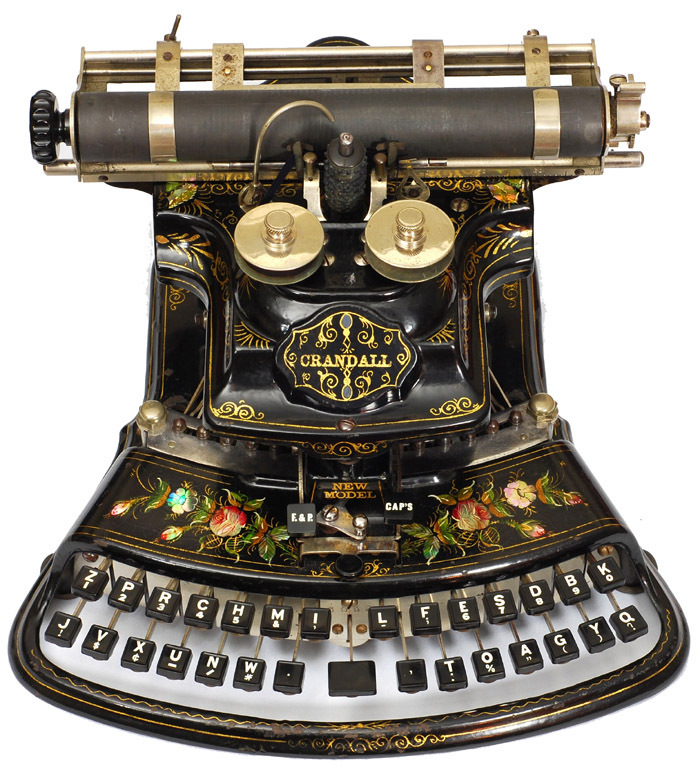 The Crandall (1886) was his third typewriter to be manufactured but the first to have a fair success in sales. One of the most beautiful typewriters ever made, it had a wonderful curved and ornate Victorian design and was lavishly decorated with hand painted roses and accented with inlaid mother-of-pearl! It seems remarkable that the Crandall, with all its fine craftsmanship, had such a low selling price of $50—most other full-size typewriters of the day sold for $100. The Crandall also had a gracefully curved keyboard, with just two rows of keys. This economy was achieved by employing a double-shift function, with an “F. & P.” key for figures and punctuation and a “CAP’s” key for capitals. One might well wonder why type-cylinder typewriters did not become the standard over typebar typewriters prior to the 1961 Selectric. The reason was speed. Even though typebars are many separate hammers striking away, each hammer has a very simple and quick action. In contrast, a type-cylinder is moved by a more complicated mechanical dance, which reduces its speed to respond to the keys being struck. The IBM “golf ball” was able to move very fast because it was light, well designed, and driven by an electric motor.